Oscar shortlisted documentary Under Fire: Journalists in Combat has one major factor in its favor -- its subjects are all seasoned journalists with the storytelling skills to prove it. At its core, Under Fire is simply journalists recounting their battlefield experiences. The extraneous stylistic punches come off as unnecessary and unfinished, while the psychologizing of the journalists -- courtesy of producer and psychiatrist Anthony Feinstein -- fails to create a convincing overarching argument. But when director Martyn Burke allows his subjects to just sit in front of a black backdrop and tell of the horrors they witnessed, it's captivating. The climate for war journalism has vastly changed over the last century, the film asserts, claiming that two journalists died in World War I and 63 in World War II, but the last two decades have seen nearly 1,000 killed. The designation of press no longer guarantees any kind of safety; journalists get no special privileges in wars of insurgency and terrorism. The nine journalists featured are all veterans of numerous overseas wars. The New York Times, Reuters, the BBC, the AP, the Los Angeles Times, and The (London) Times are all represented. 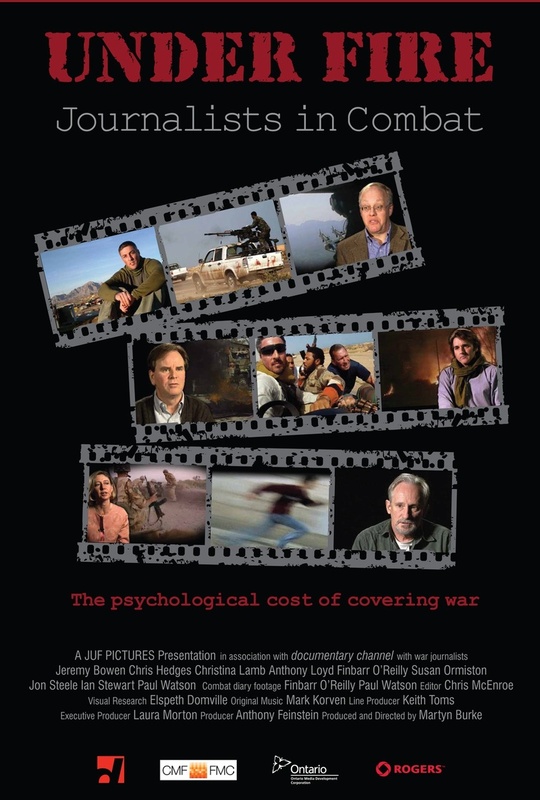 Each one discusses the unique challenges inherent in war reporting, from the physical dangers and horrific sights one experiences while on the job to the subsequent disintegration of relationships and post-traumatic stress disorder back home. Interspersed throughout is war footage captured by some of the journalists, but it isn't the focus, which renders Under Fire a not very visual documentary. One suspects that's perhaps the reason Burke felt it necessary to include a frequent stream of superimposed text -- often unnecessarily repeating the subjects' words and presented in that enervating typographers' bane, Arial. Other lackluster effects, like video footage "projected" over the subjects' shoulders to create a split-screen effect and a highlighted read-along from passages of the journalists' books is sub-TV newsmagazine stuff. All of this isn't enough to ruin the film, but it does lend a slapdash air to the proceedings. By no means does a documentary need to be slickly produced to be compelling, but it's always nice when a filmmaker just lets the material speak for itself. Under Fire: Journalists in Combat is scheduled to open Dec. 2 in New York City. Its chances of expanding are likely related to its Oscar prospects, and we'll see on Jan. 24 if the film makes the cut to advance to the list of nominees.